One of the worst possible experiences in wartime is being captured and becoming a prisoner of war (POW). One is scared, if not terrified, of being under the control of the enemy, confused and uncertain of the future and treatment to be expected. Not only is one subject to incarceration but also to the vagaries and vicissitudes of one’s captors. Inasmuch as the Japanese are well-known for their horrific treatment of POWs in World War II, maltreatment of prisoners, needless to say, goes back much further in time. Intentional or not, the hell camps of the Civil War come to mind as both sides did not contemplate a long war nor, for that matter, gave much thought to handling the overwhelming influx of those captured in arms. In the case of the American Revolution, not only were the colonials considered rebels and traitors to the British Crown, but many were captured at sea sailing aboard privateer vessels and considered little more than pirates deserving only of death at the end of a rope. In the event, fortunately, there were soldiers of the British army who were captured and, as in the Civil War, these prisoners could be threatened with death in retaliation for any executed by the opposition and was usually sufficient deterrence. With the British in control of New York City, there was a shortage of space for prisoners, never mind the possibility of their escaping or the jails’ vulnerability to raids to free them. The Royal Navy was the world’s most powerful maritime force and, with ships reaching the end of their service life, many were converted into prison ships. One, in particular, HMS Jersey, is the subject of this publication. Its notoriety has not kept it from being largely forgotten by most Americans. 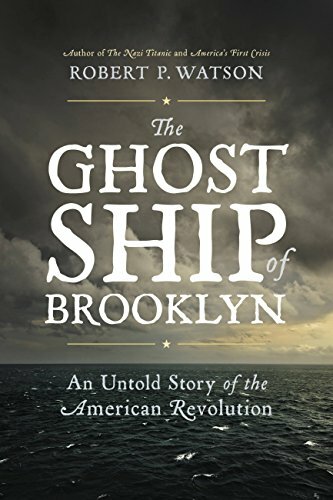 Although there were many other ships anchored in close proximity to the Jersey, off Brooklyn’s shore in Wallabout Bay, this is the one whose name was enough to inspire sheer terror among captives of the British. The lack of food, the poor nutritional quality of what they did receive, lack of hygiene and sanitation, clean water, rudimentary (if any) medical care in terms of rampant disease and sickness and massive overcrowding all conspired with verbal abuse and physical punishment for infractions of the rules to cause a death toll well into the thousands. That toll was estimated, in the book, to be as much as 11,500, though the exact total will never be known. The only temporary relief from the misery was to be assigned to a work detail for burying the dead or gathering firewood ashore for the British cooks to prepare prisoner meals. Otherwise, there was nothing more than a short period of fresh air on deck before being forced back down into the dark and pestilential holds of a ship which had to have water constantly pumped out of its bilges to prevent it from sinking, even in the relative shallows of its anchorage. On the other hand, the only possible permanent relief was in prisoner exchanges and escape. However, the former generally meant that living skeletons near death would be released while mostly healthy soldiers would be received by the British. As a result, there were very few of these while, in the case of the latter, there was a relative handful of successful escapes by which word got out of the horrors of the prison ships. This treatment by the British was intended as a psychological weapon to force the recalcitrant colonials back into the bosom of the Crown. Yet it had the opposite effect, influencing Americans to even greater exertions to attain their independence in the face of perceived British barbarity. Even after the war effectively ended in 1781, many prisoners continued to be held for another two years before the British evacuated New York, leaving the Jersey to rot and sink in the shallows. In the 19th century, memorials were placed onshore to these martyrs, many of whose bones washed ashore or were inadvertently uncovered as Brooklyn developed. As with all of those who have sacrificed lives or health to attain and maintain our independence and freedoms, these thousands of men deserve no less even if they didn’t die gloriously on the battlefield. Robert P. Watson has recounted this story to remind contemporary America of those who came before and kept their eyes on the prize in spite of the horrors and deprivations of wartime capture.